Eli Tomac wins in Colorado! 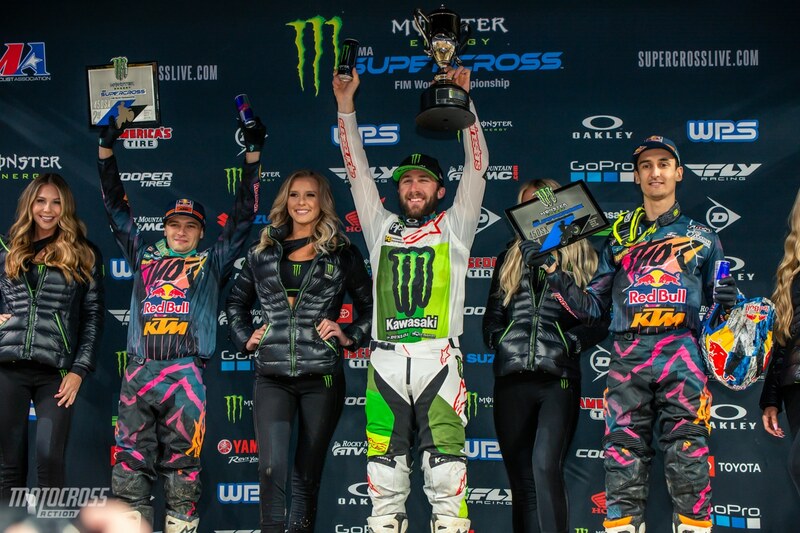 The 15th round of the 2019 Monster Energy Supercross season is over with and it was Eli Tomac who dominated the 450 main event! The day started out cold and snowy which has made for a muddy and slick track, then the sun came out and the track turned dusty and hard pack quickly. In the night show, the track was hard pack and slick again, but it made for some great racing. 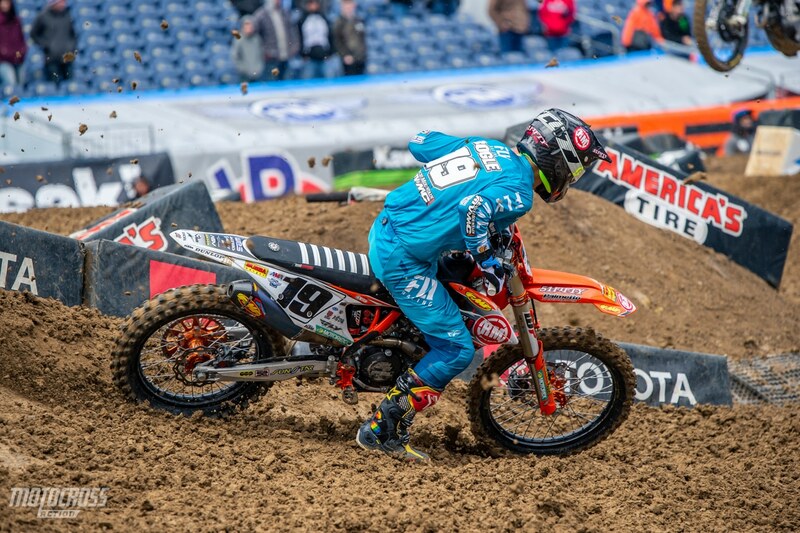 Marvin Musquin grabbed the holeshot and led at the beginning of the 450 main event. Eli Tomac and Cooper Webb were a few spots back at the beginning of the race. Cooper was ahead of Eli at the beginning but he didn’t have the speed to hold off the Colorado native. Joey Savatgy and Justin Bogle both were running up front early in the race. Eli Tomac was able to get by both of them fairly quick, but Joey Savatgy made it hard on Cooper Webb to get by. Joey and Cooper went back and forth, you could tell that Cooper was getting frustrated. Finally Cooper was able to make the pass stick and get into third. At this time Eli Tomac had already flew passed Marvin Musquin in the whoops and was beginning to check out. 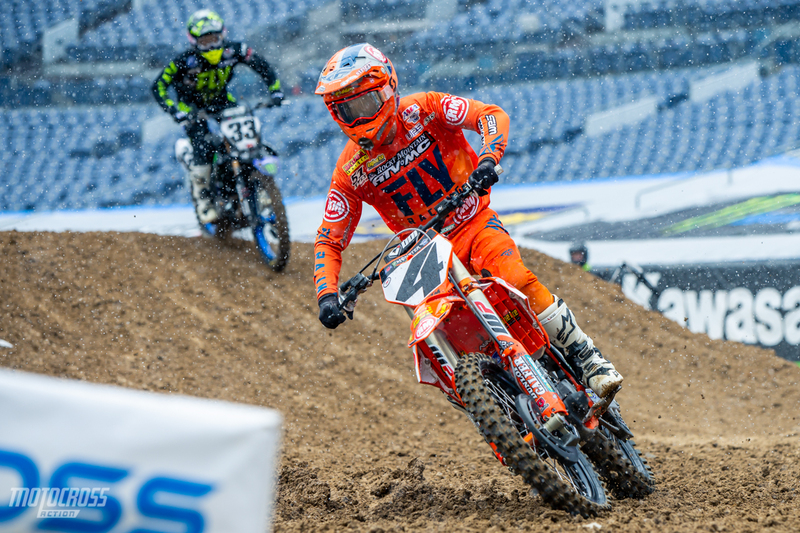 It looked like Musquin would finish second and Cooper Webb would settle for third, but Cooper wasn’t done yet. He got on the gas to catch and pass his teammate. Click her for 450 points standings. 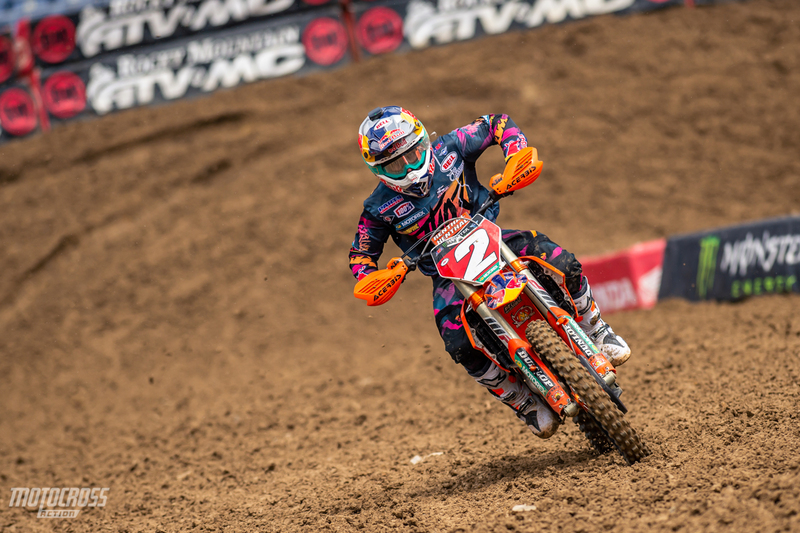 Cooper Webb finishes second in Colorado. 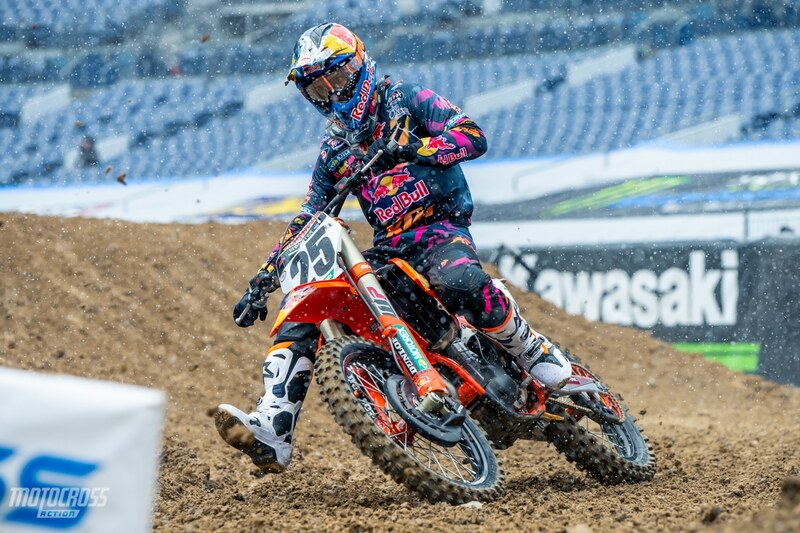 Marvin Musquin led early, but he wasn’t able to hold on to it, he finished third. 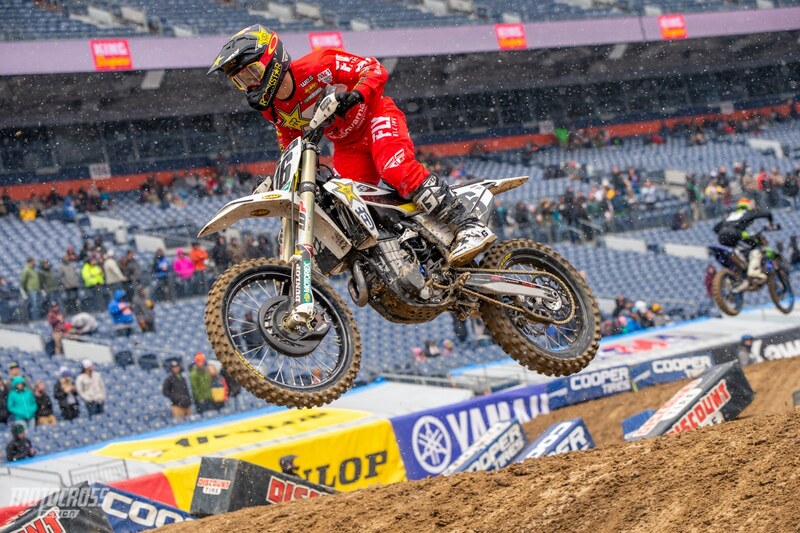 Justin Bogle rode great all day in Denver, he finished fourth in the main event. In the 450 LCQ it was Carlen Gardner who came into the first turn first, but Alex Ray snuck underneath him to grab the holeshot. Charles Lefrancois got around Carlen when he missed a triple and he ran in second for the first lap. Carlen was able to get by the Frenchman, Charles Lefrancois to finish second. John Short passed his way into third a Lefrancois would take the final transfer position in fourth. Carlen Gardner finished second in the 450 LCQ. In the second heat race it was Cole Seely who grabbed the holeshot. 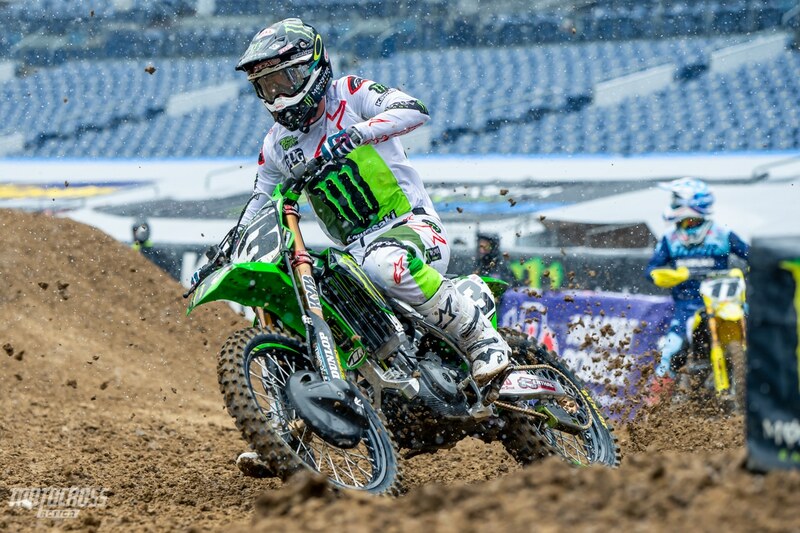 Joey Savatgy was second with Cooper Webb and Eli Tomac third and fourth. Cooper Webb and Eli Tomac had an awesome battle, they went back and forth multiple times with in two laps. The slick track has made for some great racing and awesome battles, we can’t wait to see what happens in the main event. After battling back and forth with Cooper Webb, Eli Tomac would finish second. 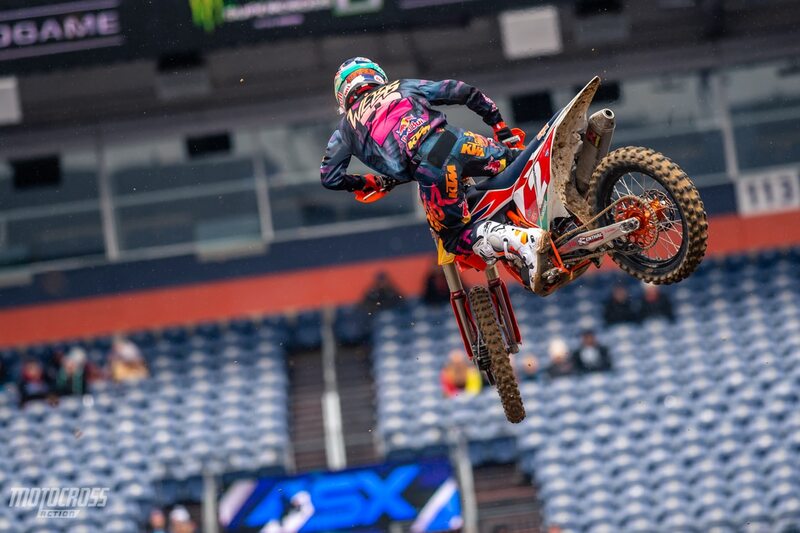 Cooper Webb is aggressive in Denver! 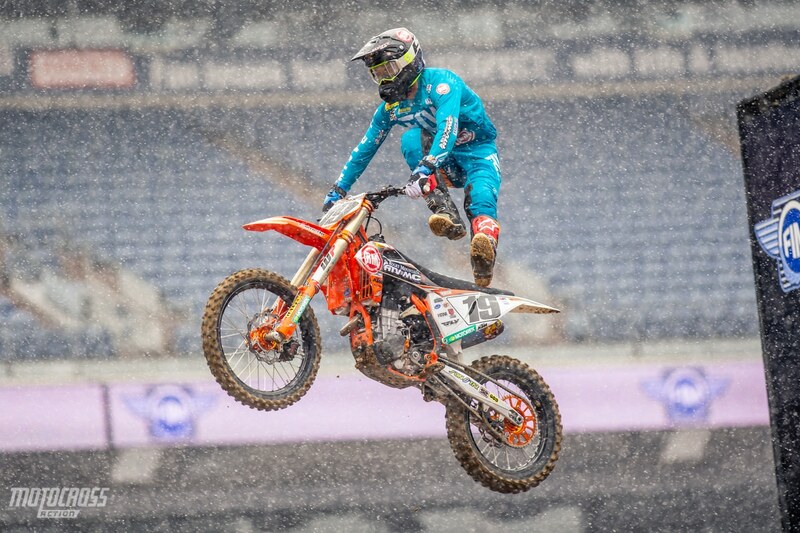 He looks very comfortable even in the middle of some tight racing with Eli Tomac. 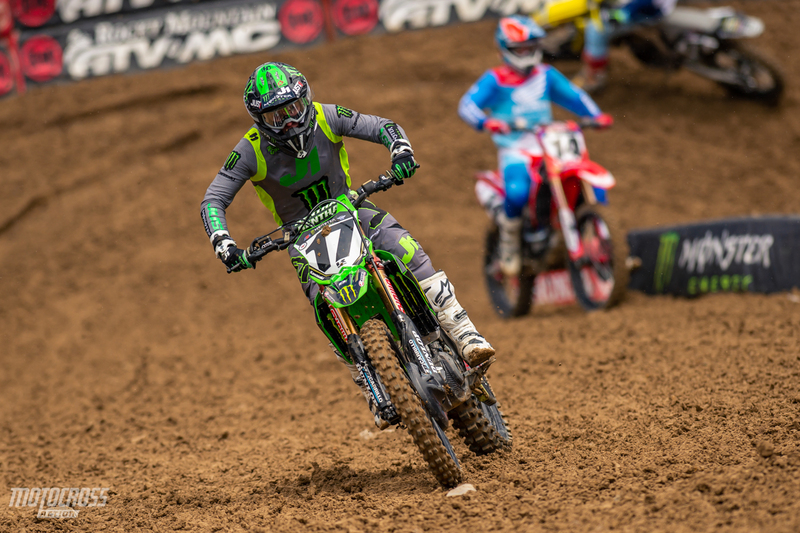 Even after dislocating his shoulder last weekend, Joey Savatgy is back and racing through the pain this weekend. He finished fourth in the second heat race. Justin Bogle grabbed the holeshot in the first 450 heat race of the night. 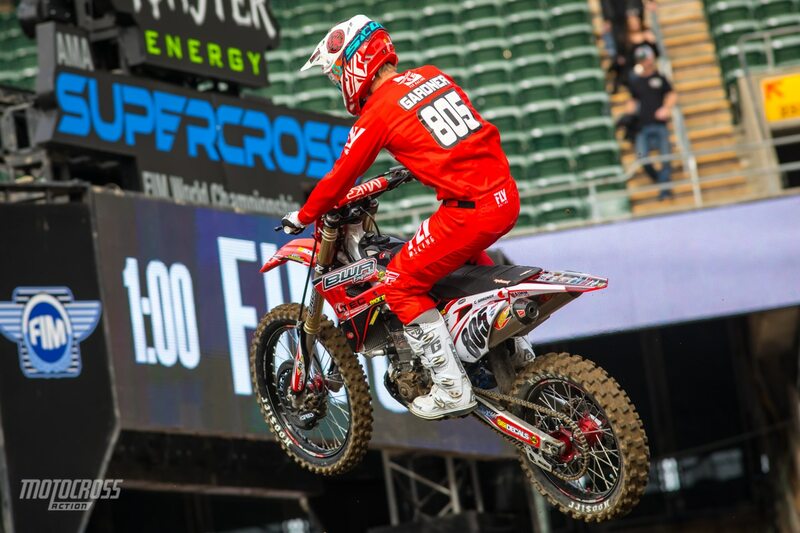 It’s normal for Bogle to be up front on the start, but for the first time this season, Justin Bogle grabbed the holeshot and he kept the lead for the entire heat race to take the win. Zach Osborne was up front on the start as well, he ran third for most of the heat race until Blake Baggett made a mistake which allowed Osborne to get by and finish second place. Justin Bogle wins his first heat race of the season. Zach Osborne finishes second in the first 450 heat race of the night. 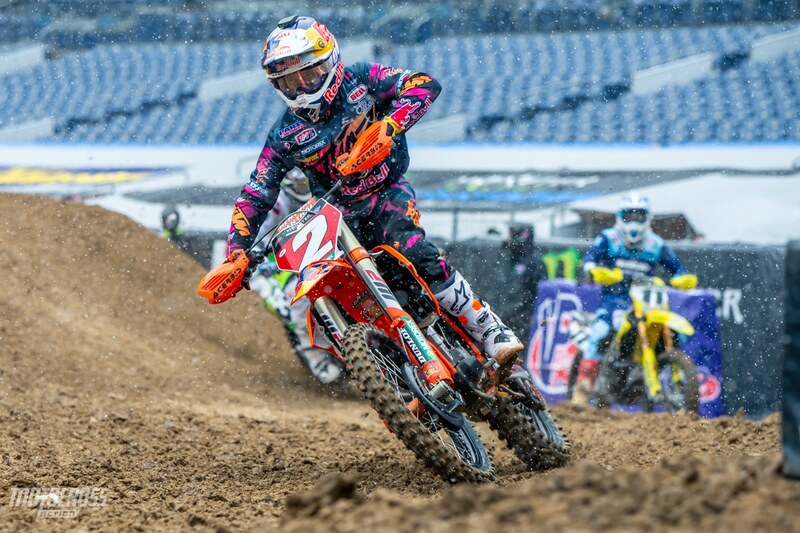 So far Cooper Webb has been fast in Denver. The slick conditions with the small whoop section could play into his favor. 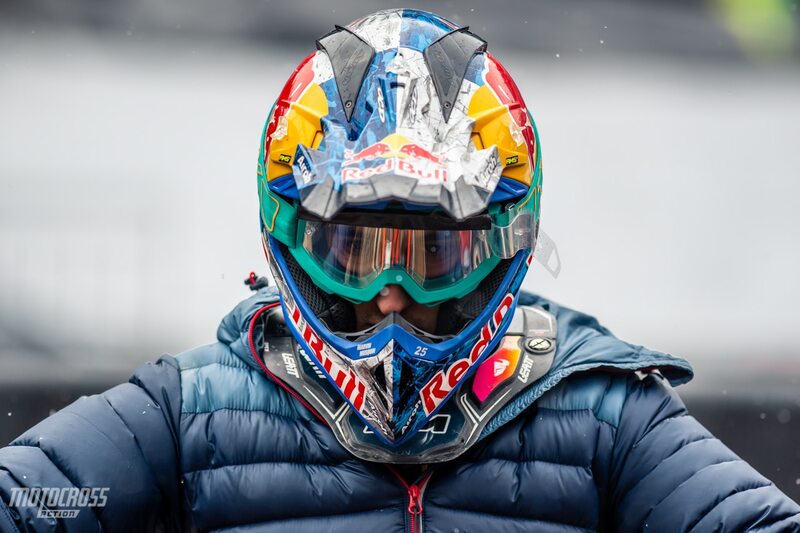 Marvin Musquin is bundled up for the cold Denver weather.